Vera Cristofani, abolitionist vegan educator from São Paulo, Brazil of Veganos pela Abolição da Escravidão Animal (Vegans for the Abolition of Animal Slavery) tells us about going from non-vegan to vegan, discovering Professor Francione and Anna Charltons work and creating together with her partner Luís Martini Animal Rights Reading Group: GeFRAN. I publish this text written by Vera Cristofani unedited. Vera Cristofani är abolitionistisk vegansk utbildare boendes i São Paulo, Brasillien. I den här texten får du läsa om hur hon gick från att vara icke-vegan till vegan och hennes första kontakt med Gary Franciones och Anna Charltons arbete. Där hon senare med sin partner Luís Martini startade ”GeFRAN” en studiecirkel i djurrättsteori, där de vill ge deltagare en djupare förståelse i Gary Franciones och Anna Charltons arbete för att avveckla djurslaveriet. Texten som Vera har skrivit är på engelska och helt oredigerad. In the year 1995, I listened to a lecture on the five Buddhist precepts in California. When it was said that the precept “Do Not Kill” should be extended to all sentient beings, I had an epiphany. That apparently simple and obvious statement suddenly brought to me a series of recollections about what I had been doing with my life regarding nonhuman animals until that moment. After leaving the lecture room, my mind was uneasy. For many hours after the lecture, I experienced mixed states of amazement, happiness, shame, and sadness. Among several issues, I wondered, for instance, why I had been so uninformed and naive to the fact that other sentient beings had to unnecessarily suffer and die to satisfy my palate pleasure. How did I fail to see that the animals I ate—such as cows, pigs, chickens, and fish—were no different from the dogs and cats whom I cared for and respected? On one hand, it was extremely sad that I was 33 before I came to this realization. On the other hand, I was happy to have had the opportunity to listen to and understand that teaching at that moment. When emotions settled down, things started to fall into place quickly. There was no doubt about what to do: I did not want to kill any longer so I was going to stop eating meat immediately. And that is what I did, without reflecting on how this decision would effect the people around me. There was an urgent need to do that for nonhuman animals, which outweighed anyone else’s negative reaction to this change. Soon after that lecture in California, I returned to Brazil, having found what I considered was a lost treasure. Of course, I was still missing the point being an ovo-lacto vegetarian, i.e., a nonvegan and a very confused person who had not realized that there was no moral difference between vegetarianism and eating meat. If I had known right from the outset that vegetarianism involves the same suffering and death as eating meat does and that the notion that vegetarianism is a morally better choice is downright false, I would have gone vegan right away. For my family, it was not a surprise and they interpreted it as just a fad that would go away sometime soon. After all, the family I grew up in was full of Italian immigrants and descendants who enjoyed family gatherings around big tables on which roasted, fried, and stewed nonhuman animals were served as food. So why did I want to act differently from the rest of the family? I was not trying to be different by giving up eating those who are not food. Actually, many past disturbing events regarding nonhumans started to have logical explanations. When I was a child, for instance, my next door neighbor used to kill a pig in his backyard on Christmas Day. My whole being totally shrank while hearing the animal’s loud shrieks; that animal’s killing always marked the end of Christmas for me. The explanations that the sentient being was food—just as the eggplant mom prepared for us—were completely unreasonable. Unfortunately, despite my disquietude and intuition that episodes like that did not sound and look right, being very young, I did not have enough discernment to realize that there was something morally wrong with making animals suffer, being tortured, and killing them for food. Thus, distracted by all the festivities, just as when I was a little girl I believed that Santa Claus would come from afar to bring me a gift, I believed that eating nonhuman animals, as a general matter, was a “natural” thing to do. And, of course, both beliefs are fantasies. As with everyone in my culture, I too was indoctrinated with anthropocentrism; there was also little chance of encountering veganism in the seventies and eighties in Brazil. The process of investigating animal ethics would only happen later. My attention was centered, for many years to come, on politics and its disastrous policies which, in my view, were responsible for the increasingly inequalities among people and the notion that problems could be solved only under fairer kinds of government. Since changing the world has never been an easy task, my choice was to try to understand it better first. Later on, my focus was shifted mainly to philosophy as an attempt to explain logically why we tend to make many destructive and irrational choices, oftentimes to protect our individuality, when all evidence shows that interconnectedness is more than a fact and should be part of every decision we make. Book after book, I looked for a plausible answer as to why we exist. The accumulation of ideas about the problems and their lack of solution, especially concerning violence and poverty that surrounded me, became unbearable, so my decision was to cut off ties with this state of things. I superficially concluded that, because I did not create these problems, I could not fix them; therefore, I resolved not to deal with them any longer by traveling abroad. Growing up in a supportive family in Brazil combined with a maturing period spent abroad gave rise to a more centered person. It was time to roll up the sleeves, stop complaining, and do some volunteer work. At that time I had no idea I was still needlessly harming nonhumans by consuming milk, eggs, honey, and that I could help them effectively by going vegan and advocating for them. But I was ready to formally get involved in a hands-on project so I started volunteering for a local humanitarian organization, where many of its members were vegetarians, helping in slums. In 2003, I became vegan based solely on my moral intuition that I should not use animals at all to satisfy my palate pleasure. This took place just sometime before encountering the challenging, solid, nonspecisist abolitionist approach developed by professor Gary L. Francione and Anna Charlton.When I talked to people about going vegan, they said, ”Please, you will get sick. There is nothing wrong with milk, eggs and honey.” Despite that, I stop consuming all animal products. Alone and without strong arguments for being vegan, I accepted a few pieces of non-vegan cakes that were offered to me when I visited people. I was practising now the horrendous trend of flexitarianism promoted by many animal organizations. I was sure about the suffering and death involved in the consumption of meat but, due to misinformation, my position about milk, eggs, honey was still lax. However, this confusion did not last long. On one of the happiest days of my life, I received a booklet in Portuguese, that was printed by a Brazilian animal group, called ”Animal Rights: The Abolitionist Approach” which contained a collection of essays written by Professor Gary L. Francione. On the second page I read, “There is no distinction between meat and dairy. To say that you do not eat meat but that you eat dairy or eggs is like saying that you eat large cows but not small cows. There is as much if not more suffering in a glass of milk than there is in a pound of steak and all of these animals end up in the same slaughterhouse after which we eat them anyway.” It was very clear, simple, truthful, and serious information from the best author I have ever read designed for people who really care about animals and want to do the morally right thing for them. After finishing the booklet, I searched for Professor Francione’s e-mail address on the internet and wrote to him saying I wanted to take a course with him as soon as possible. Of course, he had no idea who I was but he kindly answered that it was summer vacation and courses were not being given at that moment. Actually, I did not know much about his background either but I found his ideas about animal ethics to be very compelling, consistent, and serious. As I continued researching about Professor Francione´s work, I soon came across his Abolitionist Approach blog, and books. It was the beginning of a new and wonderful world for me, and as discussions evolved over social media on the Internet, I realized how little I knew about animal ethics. The abolitionist theory was striking because, although, it was not the first time I had heard messages called ”abolitionist”, previous “abolitionist” messages promoted by some animal groups did not make any sense because they failed in some aspects of a conceptual, moral or even strategic nature in relation to justice for animals. Most were loaded with welfarism and conveyed the idea that “compassionate” exploitation, such as “happy” meat, “happy” cage-free eggs, “happy” dairy etc, were morally acceptable. By studying the results of animal welfare, I learned, for instance, that it has certainly failed to offer any meaningful protection to nonhuman animals as they are being horribly exploited more and more. Additionally, in the Brazilian animal rights movement there have also been attempts to ban some types of animal exploitation, giving a wrong message that some types of animal use can be considered more morally objectionable than others. It is clear that these single-issue campaigns do nothing to really change things for nonhumans by never addressing veganism upfront and never making clear that all animal use without exception is objectionable. As a result, these kinds of messages did not sound right for the goal of ending animal slavery as they clearly created more confusion than anything else. If we reflect just a minute about nonhuman animals, we will certainly see that they do not want to be exploited and killed unnecessarily in any way. “Compassionate” exploitation is the most contradictory combination of words I have ever seen because it is an unequivocal fact that exploitation, i.e., using sentient beings as things for our own benefit, is morally wrong and should be abolished, as promoted by the abolitionist approach to animal rights, as opposed to being carried out in a supposedly “compassionate” way, as promoted by animal welfare. *All* sentient animals value their lives so if we say we care about them, the only way to align our words to our actions is by stopping to consume, wear, and use them. Finally, encountering the Abolitionist Approach was to encounter a theory that makes sense and it is really concerned about the interests in not suffering and having a continued life of nonhuman animals. While reading Professor Gary Francione and Professor Anna Charlton´s theory, all these issues were consistently explained. Their ideas provides the clarity we need to escape from the welfarist and speciesist conceptual and practical trap. The straightforward and logical abolitionist message leaves no doubt that if we think it is wrong to harm animals unnecessarily, we are hence morally obligated to go vegan. It makes no sense to go on being a flexitarian, ovo-lacto vegetarian, reducitarian, or otherwise continue being violent towards nonhumans. We must take a stand and reject all animal use in any shape or form provided we have a choice to do so for the sake of the vulnerable ones who are used as resources and whose lives are exploited, tortured, enslaved and taken away for these frivolous reasons. Furthermore, becoming a consistent vegan was the foundation for understanding other highly important aspects of the abolitionist message, such as 1) the advocacy strategy to abolish animal use by promoting veganism as the moral baseline of the animal rights movement and engaging in creative, nonviolent vegan education, which can be easily done by anyone who is willing to talk to others about animal use; 2) adopting or fostering homeless animals; and 3) rejecting all forms of discrimination and violence, to name just a few. As I engaged in volunteer work for the benefit of nonhumans, I became a part of the grassroots abolitionist movement, which started to take shape and was comprised of advocates from all over the world who promote veganism as the moral baseline to end animal slavery. In 2010, I participated in a workshop given by Professor Francione called “A Revolution of the Heart” which has borne a lot of good fruit in my advocacy; that is, aside from my everyday efforts with respect to vegan education, such as talking to people whenever there is a chance. The first step in my abolitionist advocacy, for instance, was the construction of a website called Veganos pela Abolição da Escravidão Animal (Vegans for the Abolition of Animal Slavery), which was intended as a means through which I and my partner, Luís Martini, could disseminate the Abolitionist Approach. In April 2010, we also started a reading group called GeFRAN, which focuses on the study of Prof. Francione and Prof. Anna Charlton’s theory. We have been having regular meetings once a month ever since. We endeavor to teach Prof. Francione and Prof. Charlton’s work in depth and help attendees acquire a solid grasp of abolitonist theory as education is what will end animal slavery and get people to realize that animals are nonhuman persons as opposed to things to be used as resources of others. It is so important to point out that the only way we can reach that goal is by being a consistent vegan and promoting veganism as a moral baseline, which means that, if we want to really take animal interests in not suffering and in continuing to live seriously, we have a moral obligation to not harm them and to stop eating, wearing, and using them for human purposes. We also base the content of the reading group on the Six Principles of the Abolitionist Approach to Animal Rights, which so eloquently articulate how justice and moral consideration should be accorded to both humans and nonhumans alike by not treating anyone as property, as means exclusively to an end. We also teach that veganism is a commitment to nonviolence and that nonviolence starts with what we put in our mouths, as Prof. Francione has pointed out. Moreover in the reading group, we explain that continuing to devalue animal interests is just plain speciesism, a form of discrimination intended to exclude nonhumans from the moral community that is based on the irrelevant criterion of species, which as morally unjustifiable as racism, sexism, ableism etc. The meetings take place in a vegan restaurant, they are open to the general public and they are free of charge. 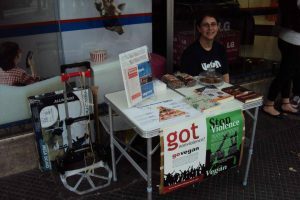 We also work with a vegan stall that is assembled around town and which displays abolitionist literature, pamphlets, and posters. 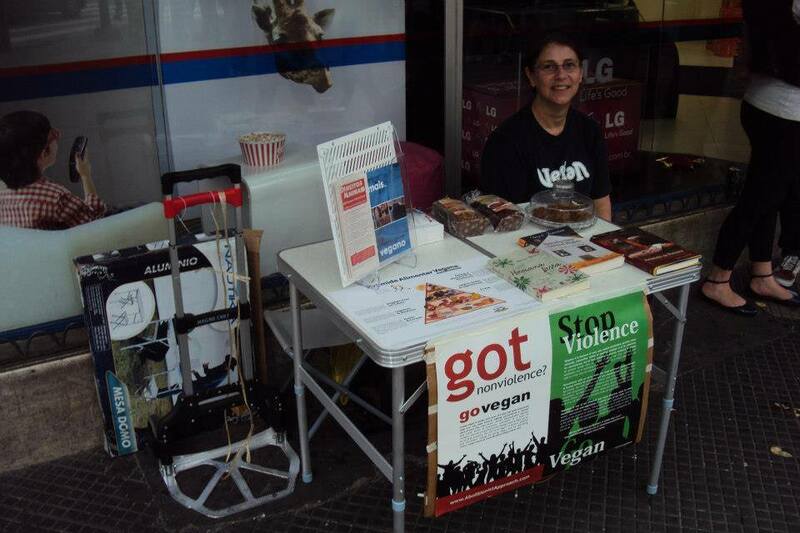 The city where I live, São Paulo, has a population of almost 12 million people so, when we are out, hundreds and hundreds of people pass by and read the messages on the posters—many stop for a conversation, for a pamphlet, and for vegan treats. In the conversations we engage in, we explain why we are morally obligated to go vegan and why reducetarianism, welfare, “happy” exploitation, and “journeys” are not morally acceptable responses to the recognition that animal life matters morally. We endeavor to get them to realize that being part of the suffering, torture, and death of nonhumans is morally wrong and that we should stop being part of that injustice by going vegan. I am happy to say that, although education and advocacy is indeed hard work, the abolitionist approach does work. Indeed, it is the only thing that will work, and I encourage all who care morally about animals to join us in this Revolution of the Heart. In conclusion, I can truly say that going vegan was one of the best things I have done in my life, and although I still walk around wondering about existence and its mystery, this crucial piece to the puzzle of life, i.e., how to truly advocate for justice to nonhumans and have a more peaceful and fair relationship with all animals, has been solved. If I could humbly leave one piece of advice, I would say that all we have in life is just this moment, and this exact moment is perfect for anyone to go vegan and to speak on behalf of nonhuman animals.